Olives have been a staple of the Mediterranean diet since antiquity, an ingredient used in Mediterranean countries in various recipes, and as a favorite snack, for centuries. Place the oil and onions in a frying pan and fry the onions until it turns into golden color. Add meat, tomatoes, mint, cumin, salt and pepper. Leave the ingredients on the fire to cook for 25 to 30 minutes. 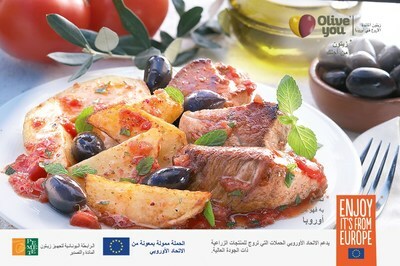 Fry potatoes together with the olives, with olive oil. Add the potatoes and olives to the mixture in the frying pan and leave the mixture to simmer on the fire for another 5 minutes. Serve it hot.